Chris has had an opportunity to do a lot of travelling throughout this career and has worked in many roles in places such as Reunion island, Mayotte, Senegal, French Polynesia, France, Egypt and he now works in Mauritius for the second time. Chris’s career aspirations run in the family. His love of management started very early and under the mentorship of his aunt. While his aunt was managing a hotel and restaurant in a beautiful Côte d’Azur Resort , Chris visited her at work often. It was during these times that he developed at taste for managing in busy resort environments. Before he was tall enough to even be able to see over the counter at the resort, he en-joyed having a dedicated and personal box used to climb up to to reach counter, game and table. Each time he visited the restaurant he amused everyone around him by requesting “his” box. challenge, any situation, and can do this well at any hotel. His inspirations come from his father who gave Chris strong values for studying as well a taste for art and opera. He continually strives to keep learning. He’s also inspired by Doctor Raoul Coulet who explained to him the real sense of life, to be positive and to continually look forward. has taught Chris a lot. In his spare time, Chris also en-joys painting, art, and all different types of music. hotel, Chris specialises in sales, marketing, pricing and global strategies and feels that with the support of his great team, they’re achieving great success. He spends about 50% of his time working on increasing the hotel’s revenues. Evenings are dedicated to meeting guests. Chris loves his job and the great team he gets to work so closely with. 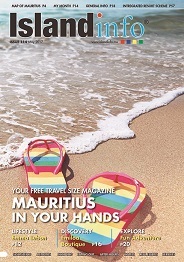 Although given the choice of several places, Chris and Tereza decided to move to Mauritius. Why? Chris says that it is due to the smiles, the kindness, the wonderful spirit of the Mauritian people, and the beauty of the country’s landscaping. Chris says that he loves everything in Mauritius. He appreciates the chance to live in such a beautiful country.